Here is the another Skype Emoticon Art. 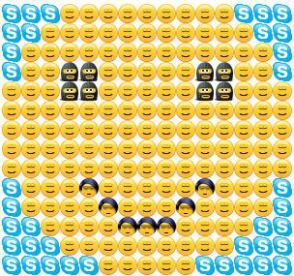 In this art, you can see a big smiley face which has been created using many three different emoticons which are available on Skype emoticons panel. This emoticon art is very cool and you can use this to surprise your friends. You can find the code below the image. Just copy & paste it in Skype Chat Box. No Comment to " Big Skype Smiley Emotiocns "